It’s a yard ornament that still makes some people shudder: A diminutive Black male figure clad in a red and white uniform stands with his arm held aloft, holding a large brass ring, or perhaps a lantern. It’s not just the skin color of the figure — or the way it seems to stand — or hunch over — so subserviently. It’s also the contorted face – the bulging White eyes and the oversized, painted red lips. It’s a depiction of African-Americans known as “pickaninny.” And it’s long been considered insulting and degrading, if not flat-out racist. Not surprisingly — much like statues of Robert E. Lee and other so-called Confederate symbols — the very existence of the “lawn jockey” – generally on private property, but still in full public view — is viewed by many as an ugly reminder of America’s past – and a visual blight on its future. Do away with them, or store them in a museum, critics say. But even more than statues of Lee – whom many Southerners still consider a hero worthy of public honor or at least remembrance – the lawn jockey has a complicated legacy. It’s one imbued with myth and symbolism, and for some, including African-Americans, the figure still evokes a measure of pride and honor. For one thing, not all lawn jockeys portray the Black figure with such exaggerated features; some images are forthright and dignified. In fact, not all lawn jockeys are even Black. A goodly portion of them are White — and contain no racial connotations of any kind (though they do imply economic privilege). And the depiction of the figure as a jockey? It’s actually rooted in history. The vast majority of jockeys at one time were African-American. In fact, during the first three decades of the Kentucky Derby, 90% of the horses that won the prestigious event were ridden by Black jockeys. In that era, a Black jockey was considered a true sportsman, no less than a White jockey — perhaps not the equal of a White man in the eyes of much of American society — but not someone to be looked down upon or disparaged, either. And there’s more: in the mid 19th century, during the waning days of slavery, lawn jockeys played a quiet but powerful role in the “Underground Railroad.” Slaves escaping from Southern plantations would look to pieces of cloth wrapped on the iron jockeys for a signal that the house it adorned might provide them with temporary sanctuary. Green would mean it was safe, red that there was danger. The idea of a Black sentinel with his lantern lighting the way to freedom gives some slave ancestors a very different impression of the lawn jockey – one that even many staunch anti-racist Whites might find hard to fathom. 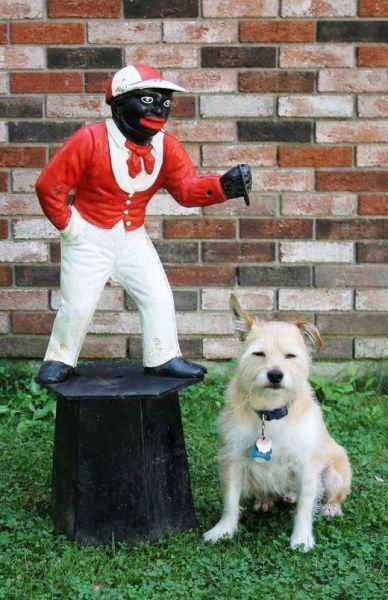 Some historians believe that the Black figure that became the lawn jockey actually predates the Civil War. They claim that it was the invention of George Washington and was meant to commemorate the role of a Black adolescent who was too young to fight with his revolutionary army. Washington, it is claimed, left the boy behind with instructions to stand watch for returning troops and their horses. The boy did just that – but froze to death in the fierce Delaware winter. Washington was so moved by the boy’s sacrifice that he ordered a cast iron statue be made of him, with his arm outstretched, ready to tend to the horses, and he placed the figure at his home at Mount Vernon. That figure, dubbed “Jocko,” was not actually clad as a jockey but it was the forerunner of the figure later depicted as one. Descendants of slaves insist that the story is true though guardians of Washington’s estate say that no such statue has ever been found — or recorded in estate records. In addition, there is some doubt as to whether casting techniques existed in Washington’s time to produce such a figure. One leading historian has called the Washington story “apocryphal.” Still, it has only added to the sense of stolid heroism that lingers over the figure of the lawn jockey in the memories of some. These days, from time to time, one hears of neighborhood incidents involving lawn jockeys. One of the most publicized involved the former city manager of Portland, who displayed one on his lawn, to the chagrin of the mayor, who publicly disavowed his former colleague. But consider this: during the 2008 campaign of Barack Obama, his field staff sometimes campaigned in white working class neighborhoods in the Midwest where lawn jockeys were prevalent. Some of those local residents also sported Confederate flags, but to the surprise of campaign workers, they also turned out to be diehard Obama supporters. They were mainly Democrats and were totally convinced that an African-American president would fight for them. To them the flag and statues were merely emblems of their ancestry; they were woven into remembrances of deceased family members. It never occurred to them that displaying these symbols was somehow “racist” or contradicted their voting preference. So, yes, lawn jockeys may be historical “relics.” But their meaning today may be far more ambiguous and open to interpretation than we think. History rarely speaks to us in a single clarion voice — there is simply too much nuance and complexity in the lived human experience. In weaving our racially divided past into a more unified present, isn’t it best that we try to tread lightly?